The notion of »the object« reveals itself currently in a novel manner that not only produces powerful pragmatic tactics and protocols (e.g. parametrics, agent-based modeling) as well as the aesthetics of a »geometry of the colossal« (Peter Sloterdijk), but it also enriches and complicates the philosophical spectrum of how possibilities and necessities can be reasoned, established, augmented, preserved or exploited. The notion of »the object« occupies a central position in a younger generation of contemporary philosophical thinkers, who seek to situate the role of speculation and imagination in reasoning from within the relation »the object« maintains to its »computability«. This lecture class introduces to some of the positions in these emerging discourses. We will trace a few invariant themes that currently resurface, and we will examine how they do so in novel and interesting manner. Thereby, we will pursue the following vector of interest: Are there novel aspects and interesting framings to be found in these discourses for developing a »speculative architectonics«? And how would such an architectonics relate to the double-interest formulated by a »verallgemeinerte Baukultur« (Expanded Culture of Building), namely to expand architecture beyond its disciplinary confines on the one hand, while attending to its local situatedness on the other? 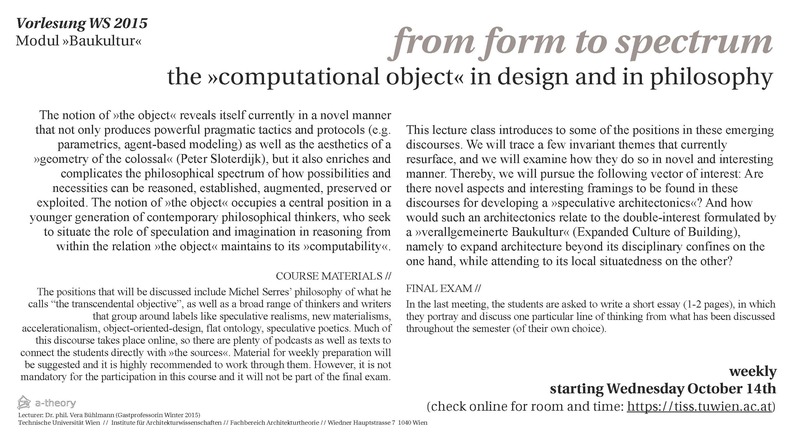 COURSE MATERIALS // The positions that will be discussed include Michel Serres’ philosophy of what he calls “the transcendental objective”, as well as a broad range of thinkers and writers that group around labels like speculative realisms, new materialisms, accelerationalism, object-oriented-design, flat ontology, speculative poetics. Much of this discourse takes place online, so there are plenty of podcasts as well as texts to connect the students directly with »the sources«. Material for weekly preparation will be suggested and it is highly recommended to work through them. However, it is not mandatory for the participation in this course and it will not be part of the final exam. FINAL EXAM // In the last meeting, the students are asked to write a short essay (1-2 pages), in which they portray and discuss one particular line of thinking from what has been discussed throughout the semester (of their own choice). 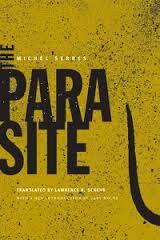 OCTOBER 14 // Theory of the Quasi-Object (Michel Serres, from: Parasite 1980, p. 224-34). OCTOBER 28 // Potentiality and Virtuality (Quentin Meillassoux, from: The Speculative Turn, p. 224-36). NOVEMBER 4 // Reflections on Etienne Souriau’s Les différents modes d’existence (Bruno Latour, from: The Speculative Turn, p. 304-33). NOVEMBER 11 // Drafting the Inhuman: Conjectures on Capitalism and Organic Necrocracy (Reza Negarestani, from: The Speculative Turn, p. 182-201). NOVEMBER 18 // The Ontic Principle: Outline of an Object-Oriented Ontology (Levi R. Bryant, from: The Speculative Turn, p. 261-278). NOVEMBER 25 // The Generic as Predicate and Constant: Non-Philosophy and Materialism (François Laruelle, from: The Speculative Turn, p. 237-260). 1-2 pages, on one of the texts discussed throughout the semester. State how you make sense of it. please email to: buehlmann@arch.ethz.ch and add „Bestimmende Diskurse TU Wien“ in the Betreff line.